The new designated areas in Warehouse District. It's one of three new "form-based" districts that include proposed specific standards for shaping the look and feel of new development. 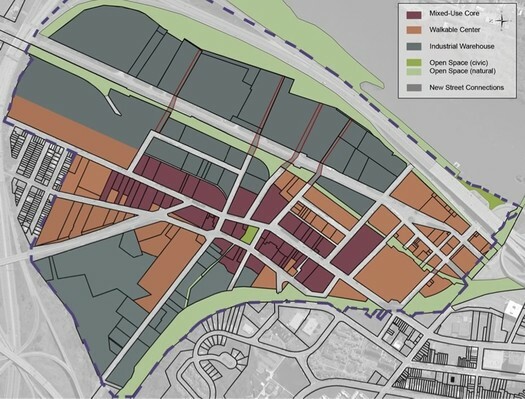 The draft of the latest module for the Rezone Albany project is out, and there are two public meetings coming up next week to go over them. A meeting about making over the city's zoning code? That might sound like a business-class trip to Snoresville. But all sorts of issues that often interest or fire up people are wrapped up in this project -- including which sorts of businesses go where, what neighborhoods look like, and everyone's most favorite of all topics... parking. This latest module -- Module 2 -- gets into some of the specific details about stuff like lot sizes and building heights. The part that really caught our interest were the proposed standards for the city's new form-based mixed-use zones: the Warehouse District, Central Ave, and the South End (pdf p. 112). All three of these areas were the subjects of intensive week-long reviews that included discussion with the public about the futures of these neighborhoods. A frontage element in which the building facade is aligned close to the property line with the building entrance at sidewalk grade. This frontage element type is conventional for retail use. 1. A habitable space at least 15 feet in depth shall be provided behind each shopfront on the Primary FacÌ§ade. 2. Shopfronts shall have a cornice or expression line above, between the first and second story (see diagram below). Expression lines shall either be moldings extending a minimum of two inches outward from the Primary Facade, or jogs in the surface plane of the building wall greater than two inches. 3. The entrances to all shopfronts shall be covered, either by an awning, canopy, second floor balcony, arcade/colonnade, gallery, or by being inset into the main body of the building. 4. Entrances for public access shall be provided at intervals no greater than 50 feet, unless otherwise approved by the Director. 5. Shopfront doors shall contain at least 50 percent transparent glass. Solid doors are prohibited. 6. The top of all shopfront window sills shall be between one and three feet above the adjacent sidewalk. 7. Shopfront windows shall extend up from the sill at least eight feet above the adjacent sidewalk. 8. The ground floor of a shopfront shall have untinted transparent storefront windows and/or doors covering no less than 50 percent of the wall area. See FacÌ§ade Transparency for additional requirements. 9. Shopfront windows may not be made opaque by window treatments (excepting operable sunscreen devices within the conditioned space). Reflective and frosted glass is prohibited on shopfronts. Low emissivity glass with high visual light transmittance may be permitted. 10. Storefronts must remain unshuttered at night to provide views of display spaces and are encouraged to remain lit from within until 10:00 PM to provide security to pedestrians. There are other standards about types of building materials allowed (example: no vinyl siding) and how much of a building front is to be covered by windows. It always comes back to parking, doesn't it? + In general, it appears the parking minimums for many uses would be somewhat smaller under the proposed new standards. + Look at all those standards for bike parking. + Wednesday, February 24 at 6 pm at 200 Henry Johnson Blvd. The frontage and parking standards look promising. Now if Broadway got a protected bicycle lane, that would be real progress! As a whole, I'm very encouraged by this initiative, which I think will make Albany a more attractive city for development. I think this will also go a long way for small business owners and entrepreneurs, who may want to do exciting, creative things but are stymied by the current set of zoning policies that are far outdated and like compacted snow from a long season (just now this yearâ€™s) have become too heavy and dense over the years for their own good. Iâ€™ve taken a real quick scan, especially in regards to the parking minimums and think we are moving in the right direction, especially to curb the cost of projects (where the city requires developers to secure far more parking than is really necessary) and build synergies off of transit points (love the feature that parking minimums can be reduced if located close to a transit stop). By and large, very happy with how this proceeding. Why on earth are we still including parking minimums at all? A great example of how insidious the city's subsidization of the suburbs is - even when we recognize the problem we can't move forward with the actual solution. Let's get rid of parking minimums altogether.